The announcement that samurai swords are to be banned in England and Wales has been welcomed by those who have campaigned against their sale. But collectors and martial arts enthusiasts are concerned legitimate owners may fall foul of the law. Barbara Dunne hopes the announcement is vindication for years of campaigning against bladed weapons, and samurai swords in particular. In 2003, her son Robert from Middlesbrough was killed by a teenager wielding a samurai sword. The weapon punctured his heart. Jason Kelly is currently serving a life sentence for murder. Ms Dunne believed her son would have wanted her to campaign against such weapons and she has done so with gusto. She took a petition to Downing Street, wrote to MPs and compiled a dossier of other weapons. She believes this is a reward for her efforts. "It's an achievement to get the weapons banned. I don't want children to keep seeing them in shop windows and thinking it's normal." Ms Dunne was one of those who responded to a government consultation on the issue earlier this year. Despite her opposition to the swords, she agrees there should be an exemption for genuine martial arts enthusiasts. Fay Goodman is also hoping there will be leniency towards sport. She has good claim to being Britain's most skilled swordswoman. She practises Iaido, a Japanese martial art which uses the sword, and is one of only three women outside Japan to be graded a seventh dan. 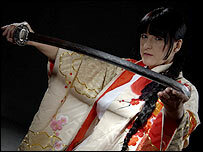 But Ms Goodman is among those worrying about the government's decision to focus on samurai swords. "I am concerned. It depends on the small print. Martial artists using swords begin with a wooden one, progress to a blunt weapon and finally start using a razor-sharp blade. "These weapons could be banned if the government goes too far." The former athlete, who won a gold medal at the European Championships in 1995, is not totally against new legislation. She admits there could be a case for a licensing system. But she points out: "People need some protection but criminals could use anything. 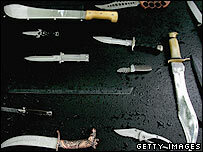 The biggest amount of knife crime is actually domestic violence. Guns were licensed but shootings have only increased." It is not the first time samurai swords have incurred the wrath of a government. In 1867, Japan banned people from openly wearing swords and abolished the samurai class. That decision, more than a century ago, led to many beautifully crafted weapons entering the market. Two million swords known as "gun to" were made during World War II, again feeding the demand from western collectors. Today there's a thriving market. 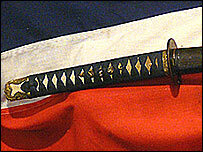 Rare swords can sell for tens of thousands of pounds. I don't want children to keep seeing them in shop windows and thinking it's normal. Mark Hawkins owns the Lanes Armoury, a specialist shop selling arms and militaria in Brighton. He has a number of samurai swords for sale, and says collectors are primarily motivated by their beauty and history. "Genuine and reproduction swords look similar. But they're not really the same. It's like comparing an oil painting to a photographic print." Mr Hawkins is unlikely to be affected by the legislation because his swords are expensive historical items. Other businesses may be less lucky. Lawrence Taylor runs one of the largest Internet dealers in the country. Blades-UK has dozens of swords and other weapons at cheaper prices. Mr Taylor argues swords are often blamed for deaths caused by long knives: "I'm disgusted. A ban won't make any difference. More people are killed by guns and screwdrivers." Tens of thousands of collectors and martial arts enthusiasts will be affected, and there will be confusion about what actually constitutes a sword." Blades-UK has an age verification system, and Mr Taylor says he does not sell to anyone under the age of 18. But if the government gets its way, replica swords will need to be put back in their scabbards permanently.